Job van Schipstal is Software Engineer at IXON in the Netherlands. Robots are the future. Factories all around the world are using or starting to use robots for automation purposes. One of the world’s leading robotics providers, Universal Robots, builds flexible and easy-to-use robots which can be programmed to do many complicated tasks with the easy-to-use teach pendant. The robots have been designed to be both user-friendly and powerful, providing advanced possibilities for experienced users. But how do you manage your robots once they’re in use on site? How can you investigate why a failure occurred, update the robot’s configuration or analyse the robots actions? That’s where we come in. IXON facilitates secure cloud connectivity to your robots. Robots usually feature an ethernet port. Why not just connect the robot directly to a network? Because it’s not without risks. A robot is not designed for IT security and a direct connection poses many security threats. When you update your robot’s software, this only affects the robot’s control application and not the controller’s operating system. This means that any holes in security will never be fixed. If there’s a malicious user on your network, they’d be able to connect the robot and start and stop it, or modify and delete your programs. They could even login to the controller through a protocol known as SSH, giving them full access to the robot and the ability to render it unusable. A firewall prevents this from happening by blocking malicious traffic before it can reach the robot. The IXrouter is standardly equipped with an advanced firewall to solve this issue. It has five ethernet ports, one WAN and four LAN. You can connect the WAN to your company network for internet access. The LAN ports can be used to connect your IXrouter to one or multiple robots, creating a small robot network. An advanced firewall separates these two networks from each other to guarantee a secure environment. Cloud connecting your Universal Robot: what are the benefits? The IXON solution offers many tools for remote control and management. The IXrouter, an IoT gateway, is seamlessly integrated with the IXON Cloud and automatically sets up a secure connection to the cloud. Accessing your robot via the cloud has been made easy using VPN or VNC technology. To make it even easier for you to remotely access your robot, IXON has developed a URcap called the IXON Connector. Universal Robots does not have built-in VNC servers, so this plugin makes it possible to easily install and configure a VNC server on your robot. With a VNC server you can view and control the teach pendant screen. This functionality is integrated into the IXON Cloud, which means that you can view it directly from your browser or mobile app. An easy, no-code solution that complies with the highest security standards. But the IXON Cloud provides even more Industrial IoT opportunities. 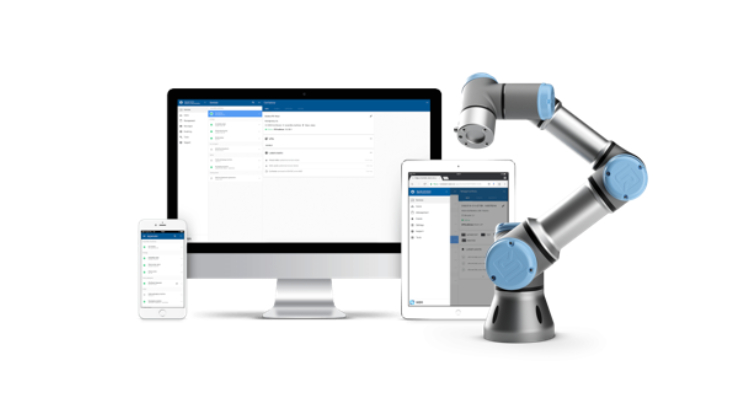 Gain insight into the robot’s data using Cloud Logging or receive notifications about important events with Cloud Notify. Data reports give insights into joint status, robot status, temperatures of various components, etc. Set up a trigger which sends you a notification if the robot’s status has changed from running to emergency_stopped, or if the controller’s temperature has skyrocketed. For more information about the IXON Connector, visit our partner page on the Universal Robots website. or request a 30-day evaluation kit to try the IXrouter for free.